The MotH has a problem with me calling this a cheesecake because that just makes everyone thing dessert and I do, really, get that. But when you preface the name with savory, I hope people can somehow make the transition. Definition of a cheesecake – having a firm custard-like texture, with cream cheese, cottage cheese, or both. Well, that fits. But when get right down to it – this has an almost (almost) obscene amount of cream cheese and eggs which is what most cheesecakes do. Preheat oven to 300°F. Brush 9 inch diameter springform pan with 1 tablespoon melted butter. Finely grind oyster crackers in the food processor. Mix cracker crumbs, Parmesan and 5 tablespoons melted butter in food processor to blend. Reserve 1/2 cup crumb mixture for topping; press remainder onto bottom and up sides of prepared pan. Refrigerate while preparing filling. In a stand mixer, beat cream cheese and eggs until smooth. Mix in remaining ingredients. Pour filling into crust. Sprinkle reserved 1/2 cup crumbs over. Place cheesecake on rimmed baking sheet. Bake until filling no longer moves in center when pan is gently shaken, about 2 hours. Cool 30 minutes. Serve warm or at room temperature. Make Ahead: can be prepared 1 day ahead. Cover and refrigerate. Let stand 2 hours at room temperature before serving. We are going to stretch this for a day for Thanksgiving, but I am pretty confident in it (see hurricane story below). I made this the first time in 2004. It was really good. Not sure what the occasion was and we went to the MotH’s parents’ house just around the corner*, but here is the key point: We all liked it and – just to bury the lede – it was a great leftover after Hurricane Ivan took us out mostly. No, really. Just keep the fridge closed and things can stay safely in there for a day or so. This really worked, and to be honest, you do not want any kind of warm food right after a hurricane – um, ever. That is why Mandarin oranges are my go to food after a hurricane. Even at room temperature, they just rock. That said, I have not made this since 2004 – likely out of an odd sense of “perhaps this is not a good idea,” but I am totally feeling out of hurricane season at this point. Thankfully, we dodged a big bullet in Irma, and Nate was just annoying, but no really biggie. Source: Bon Appetit ? – will find out. 2 day method – crust mixture one day, cream cheese mixture next, assemble third and bake, serve at room temperature the next day. Very good, yes, if I do say so myself, but my unsuspecting family testers said so. But both the MotH and is brother approved of my suggestion of serving with hot sauce – brand: Crystal. Why Crystal? – heat, but also flavor and it does not completely blow your palate like Tabasco – which I also like, in certain applications, but not this one. The Boy has other opinions on hot sauce that usually include habaneros. Crust is really crumbly on sides – and totally messy the entire time I was dealing with. Maybe just do bottom crust and topping – needs work, but the flavor is really good – just reduce the amount by probably half (?). Next time with minced fresh jalapeño (The Boy) – another thought or a little pepper jelly would not go amiss at this point. Oh, pepper jelly on the top as a thin layer?? Maybe going too far afield. Nope, I don’t think so. Or with pan-roasted mushrooms and spinach (or cress) as long as all the liquid is cooked out of both in a ruthless sort of manner. Little Dijon swirled in? This could be a great Easter appetizer too. Okay – and the work hack version with the cranberry horseradish relish was a revelation. Not a bad thing at all. Another really good option for some spice with this cheesecake. And what to do with the rest of the oyster crackers – must be something, right? *Might sound like a nightmare to some, but my in-laws are just the best. I love them dearly – always will. The Boy and I are very fortunate. Yes. It’s that time of year, again. Sweet potatoes biscuits with ham, horseradish cream, and cranberry relish. Another Thanksgiving and a new version of a sweet potato biscuit. I am still searching for some illusive thing in the sweet potato biscuit department. Will I ever find it? Not sure, but I will not stop looking until I am very satisfied with what I am baking. Tried a new recipe – did not work, um, at all. I am sorry. I am not satisfied. These were blah. I did like the idea of the grated frozen butter though but I am thinking I am going back to my recipe from Foster’s Market. Lord I loved that place. Maybe Sara Foster would let me open one here it the best part of Florida which is, by the way, just Lower Alabama. This is LA. So here is my go-to so far. And what I will make this weekend for our Friends-giving pot luck appetizer lunch on Monday. Thank goodness is we have a three day weekend, because otherwise this would never happen especially since I have to plan for way more food than I may never make. 2 Tbsp. salted European butter, melted – spend the little bit extra. Preheat oven to 425°. Stir together first 3 ingredients in a large bowl. Cut butter cubes and shortening into flour mixture with pastry blender or fork just until mixture resembles coarse meal. Cover and chill 10 minutes. Whisk together buttermilk and sweet potato in a large measuring cup. Add to flour mixture, stirring just until dry ingredients are moistened. Don’t over work this – I think it effects the rise. Turn dough out onto a well floured surface, and knead lightly 3 or 4 times. Pat or roll dough to 3/4-inch thickness; cut with a 2-inch round cutter, reshaping scraps once (Do not twist cutter – this is way more important than you may think, but biscuits are a bit fussy about things like this – just don’t do it. The won’t rise well if you twist.). * Place rounds on a parchment paper-lined baking sheet. Bake at 425° for 18 to 20 minutes or until biscuits are golden brown. Remove from oven, and brush tops of biscuits with melted (salted) butter – do this, yes. Serve immediately. Source: Foster’s Market – Foster’s is on the 15-501 between Chapel Hill and Durham, NC. It is a fanciful place that does so many things well. I miss it greatly, but I loved going there. Sara Foster is gifted in a way not many people are and it was a great joy to be able to frequent the shop/restaurant/coffee shop/whatever. The Foster’s Market Cookbook is the ONLY signed cookbook I have. Ms. Foster is charming, engaging, and lovely. Made a half recipe this time, excellent as always. *This year, did not bother with biscuit cutters at all and just used my # 30 disher and it worked out really well as a drop biscuit. Yeah, so much easier than rolling and cutting and whatnot. Not quite as uniform, but tasty all the same. I cannot remember when I started making this open-faced sandwich but it was an immediate favorite in this house. It seems odd at first, but it really works when you think about all the flavors mixed together. A little tart from the vinegar, some mustard, apricot jam for sweetness, then ham (pork is never bad in any form) and a sharp cheddar. It is a very special combination. And heats up well as a left over in the oven – or in my case in the toaster oven at the office – work lunch hack – woo hoo. If I can get it – usually the MotH and the Boy do not let me get much in the way of leftovers. But I guess that just means they like it – a lot. And so do I. 1/4 cup apricot preserves – way more than that. 1/3 pound thinly sliced tavern ham, yes, specify tavern ham – I’ve tried others and this is the best. Between two pieces of plastic wrap or inside a gallon plastic zip-top bag, pound the chicken slightly until it is more even. It does not need to be super thin, just a little more even. Makes for easier (quicker) marinade and more even cooking. Season chicken with salt and pepper. In a resealable plastic bag, add vinegar, mustard, and chicken. I don’t even measure at this point any more. Once you do this enough, and once you taste it you will, you will get the hang of it. You can also add a mashed garlic clove, but I have given up on that little bit trouble – not necessary in the taste department, to us anyway. Let marinade several hours or over night in the refrigerator. Over night is best, but not much longer than that. Heat broiler on low and line a baking sheet with foil. Remove chicken from marinade (discard marinade) and place on the baking sheet, broil, turning at least once until opaque throughout. Check by cutting into chicken to see if it cooked through. Transfer chicken to work surface and discard foil. Reline the baking sheet with new foil. Place baguette on baking sheet, cut side up (duh). Spread each piece with apricot preserves, layer with chicken, ham and cheese. Broil until cheese is melted. Source: Martha Stewart with my modifications. My refrigerator… and ham salad. So I didn’t go to the grocery store like I should have today, and now I feel like making something but I have to make do with what’s in my refrigerator. And here is what I have to work with: Boursin, chutney (not homemade, boo), puff pastry, dates, bleu cheese dressing, a lemon, eggs, butter, bleu cheese, Parmesan, Pecorino, Brie, Kerry Gold Reserve Cheddar, and Hormel ham steak. What should I make? What can I make? It is a weekend and I will get to the Publix at some point and then I have a whole other list of things to make for my work week lunches. So here is what we are going to try and make work – we shall see how it goes. I feel confident that it will not be a disappointment. At least I hope not. We shall see. Another no recipe recipe. That is not a bad thing when you get right down to it. 8 oz smoked ham steak, trimmed that weird stuff that is around the outside edge (what is that? ), and cube it. Into the food processor it goes for 8-10 pulses. 3 Tbs sweet relish, drained like you would do for deviled eggs. Totally subjective – add more or less to your taste, but do make sure you drain it. I like relish in my ham salad. Yellow or Vidalia Onion – yikes there are lots of options here, but I think I will start simply. Yellow onion grated on the large holes of a box grater and make sure you get all the onion juice – that is really important. Or if you are like me, you can use the food processor for this too – no need to clean it since the ham and onions are going in together. Freshly ground black pepper. A great spice in my opinion. But it must be freshly ground – I think that goes without saying. Duke’s Mayo* – just enough to hold it together, but not go overboard. This might be subjective but as my mom would say, you can always add more, but you can’t take it away. Guess that’s why I will add this last. 2-3 Tbs seems to work, though to be honest, I don’t measure, I just wing it. *No substitutions, I mean, if you live in the South anyways. Not sure what the rest of you do for Mayo – sad to say. ~The same thing can be said for hummus too. The flavors need to come together to really work. Prep for Christmas – in all its forms. We had a very quiet Thanksgiving which I enjoyed, but I am glad Christmas is going to be an all-out family party. I love the way my brother-in-law fries a turkey. No matter how many times I roast one (thank you AB for the best roasted turkey of all time! And I should add, the first turkey I ever made in my life), I still prefer a fried turkey, but do not have the nerve (or equipment) to do it myself. Very glad he does. Christmas Eve – just an aside – This is my favorite part of Christmas because growing up we had a smorgasbord (sorry lacking the umlauts and accents). Or at least my eleven year-old version of it. Why my mom let me kind of take over to a degree – although she still did most of the cooking, I have no idea. But that is what happened in my family. Christmas Eve we opened presents from each other and munched on a buffet of all kinds of things that my mom made and a few that I dreamed up. At the time, I realized I wanted to be a caterer, so it is not surprising that I went into event management – not really. So for me Christmas Eve is meant to be relaxed. Our new tradition from a few year ago is to have Cheddar fondue night with all the things that go with it. In our case, that is apples, pears, grapes, baguette, and to gild the lily, some Boursin (for the baguette, not the fondue). Maybe some Brie or, well, who knows. I always shop on Christmas Eve to get the freshest things I can find. It is so simple and it can be scaled for however many people you have. In our case, it is small – typically four of us, but fun nonetheless. I am just a bit too excited about this. Oh, and then there is dessert. Whatever kind of cookie I make for the next day – but we hit it anyway. Although after a bunch of fruit and cheese I do not have tons of room. Well, that is what I tell people. Christmas Day – Morning. I am kind of going easy this year. I have my mom’s Banana Nut Bread that I will slice and broil until crunchy and smear with great salted European butter. I probably could just do with that. But I want something else, but something simple. This year, not sausage balls (which are a huge tradition in my family), or latkes which I love more than words, and yes, I might just be being a bit lazy in this department. But there may be just the two of us so I am going with sautéed hot breakfast sausage that I then add scrambled eggs. So the eggs cook in the sausage grease – it is amazing. That was the only way I ate eggs as a kid (long story – see: allergies). Then the plan is to bake my stuffed mushrooms which you will see and reheat my Sunday Sweet Potatoes which you have seen way too many times, for Christmas with the family. I will have the third batch of Cranberry Horseradish Relish made by then and have more bags of cranberries in the freezer than make sense. And have put up the pecan/walnut tassies as well – again things that people seem to really like. So on the 28th, we are having another family thing on the beach – super cool! I plan to make my (yes, you’ve seen it here) sweet potato biscuits with something in them. May try to change this up this year. Probably will not, but … I might. You never know what happens. I am dreading going to the grocery store today. I have put it off since it’s been raining for days. And the forecast does not get any better until, well maybe if we get really lucky – not likely, Friday for Christmas Day. That said, it will be in the 70’s. Not any kind of Christmas weather and certainly not any kind of candy making weather. Guess I am waiting for January for cold and dry to make Vanilla Taffy or English toffee, or Divinity or even Peanut Brittle. Nothing too unusual in the grand scheme of things. But irksome. I always seem to make too many sweet potatoes for my most requested Sunday Sweet Potatoes – I just never know how many potatoes makes how many cups. Or how many sweet potatoes make a pound or whatever. I suppose one day I will have to figure that out. Ugh – math. Oh, and in November / December sweet potatoes are really inexpensive. Like .49 cents per pound – hello, just buy lots. If I remember correctly, they are also a local crop for us. Cool. Our dogs love mashed sweet potatoes. Yes, they do. The Big Dog was a huge fan. They also keep for a good while so you can surprise the pups with them through January and February. I always did almost anything to make the Big Dog happy. Duke – The Big Dog – Best GSD. Ever. Another thing is to make sweet potato biscuits. Sublime things, that are stupidly simple. 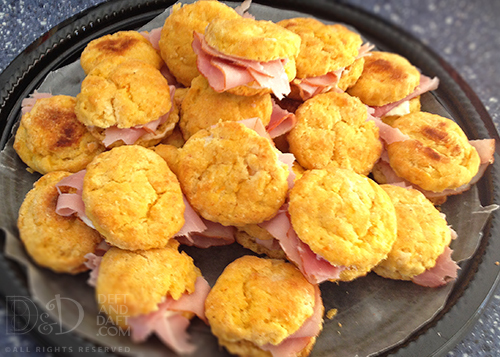 I was living in Chapel Hill, NC the first time I had sweet potato biscuits and they were served just like this – with salty ham and horseradish cream. Heavenly. The caterer for my job (love you JW) was the one that introduced me to it. I cannot believe, being a kind-of* Southern girl, that I had never had them. My mom made biscuits often, although if you asked me to re-create them, I would not be able to, but she’d never made sweet potato biscuits of any kind, even though she was from NC. Not sure where the “lost in translation” bit happened. I will just be grateful I found these when I did. Whisk together buttermilk and sweet potato in a large measuring cup. Add to flour mixture, stirring just until dry ingredients are moistened. Don’t over work this – I think it will affect the rise. Turn dough out onto a well floured surface, and knead lightly 3 or 4 times. Pat or roll dough to 3/4-inch thickness; cut with a 2-inch round cutter, reshaping scraps once (Do not twist cutter – this is way more important than you may think, but biscuits are a bit fussy about things like this – just don’t do it. The won’t rise well if you twist.). Place rounds on a parchment paper-lined baking sheet. Bake at 425° for 18 to 20 minutes or until biscuits are golden brown. Remove from oven, and brush tops of biscuits with melted (salted) butter – do this.. Serve immediately. Made a half recipe this time, but they were excellent. *You have to put the “kind-of” in front of Southern if you are raised in Jacksonville. Sigh. Even if your parents are really Southern. I guess it is time to start thinking about the fall baking/cooking season and, dum dum dum … Thanksgiving. It seems that Thanksgiving always sneaks up on me. Because it does not get cold here, really, until after January. I’m still wearing opened toe sandals for heavens’ sake. I can’t imagine doing Canadian Thanksgiving – October 12th. Too soon for us in the South, but not too soon for them, I suppose. Good on you! Down-sizing recipes – for a few of us that is what will happen. How do you scale down cornbread dressing? I have no idea. Depending on what family stays, what family and friends are coming into town, and what family goes to others out of town, it makes a difference in planning. But there are certain things that just must happen for Thanksgiving. Cranberry relish – yes! Why not biscuits for Thanksgiving? Hello, we are in the south – yep. Drop biscuits are my favorite. Sour Cream drop biscuits instead of my usual Parker House rolls. I think I need a new filling for my sweet potato biscuits. I love them the way they are, (with ham and horseradish cream} but I think I must come up with something new. But I do think horseradish will be involved. It is a stupidly great combination. Something with corn – I’m thinking a corn soufflé which could be really cool. Some kind of apple dessert – slab pie, maybe? Or this apple cake “Tatin” thing? Did that this month, and … so amazing. You can read about here. A Fall Salad – with apples, pecans, some spinach and, in my perfect world, mandarin oranges. Yep. Do hate all the pumpkin crap,,, Guess that is, mostly, because everyone goes all pumpkin crazy beginning in August. It is just way over kill. And the taste is largely meh. But apparently I’m in the minority on this one. I just don’t get it.